We are offering a quality approved range of Fluoride Chemicals, which are used for industrial purposes. These chemicals are formulated under the supervision of chemical experts so that we can offer a flawless range of chemical to our patrons. Bisoprolol Fumarate (104344-23-2) is colourless liquid. 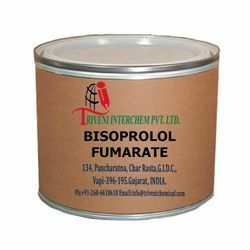 it is use in hypertension and high blood pressure Industry.Bisoprolol Fumarate (104344-23-2) is colourless liquid. it is use in hypertension and high blood pressure Industry. Nebivolol hydrochloride (152520-56-4) is solid. It is also known as Nebivolol hcl. It is use in Beta blockers Industry. Looking for Beta Blockers API ?